Over the years, as my work improved and I became better known, I would be increasingly contacted and asked for help and information from DALEK fans and builders, or to supply bits and pieces for off-shoots of the actual TV series. My old TARDIS and DALEK props would be borrowed for events, promotions, and publicity related to DOCTOR WHO. On one vividly remembered occasion in 1985, the then producer, JOHN NATHAN TURNER, had been frantically ringing me while I'd been out somewhere, because he wanted me to make a VERY urgent GIANT CHEQUE for BBC charity event, CHILDREN IN NEED. 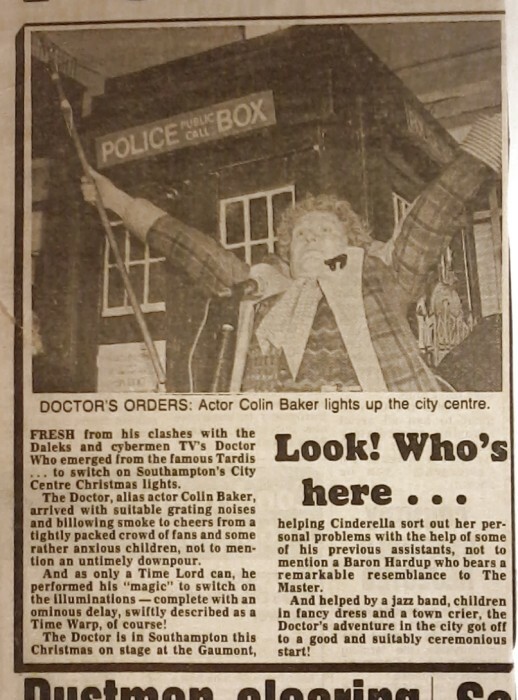 The brief I was given was to produce an extremely long (20 feet) plastic cheque, which all of the DOCTORS and COMPANIONS they could find, would carry out of the TARDIS, live 'on air'... And it was all needed in less than 48 hours time! Nowadays, that item would be zipped out of a computer in hours. But back then, it all had to be hand-made. Prop work often means working through the night, so I had a lot to do, in a very limited space, and was up until 5 AM. I did lots of measuring, glueing, sewing, positioning of letters, etc. All for something that was seen on screen for just a few seconds! But as the picture shows, it was a heck of a gathering of original series actors. On the night of the event as host, TERRY WOGAN was talking to astronomer, PATRICK MOORE, the TARDIS arrives and out steps a stream of DOCTOR WHO stars, including PATRICK TROUGHTON, JON PERTWEE, and LIZ SLADEN, carrying the giant cheque. So it was well worth all my efforts for such a unique TV moment.